Chameleon has been caught in his masquerade as a member of the Science Police, and stands accused of murder. The person impersonating a police officer back in Issue 16 was imprisoned and undergoing interrogation, when he was suddenly killed inside his cell with no noticeable means of entry for an assassin. The SP are blaming Chameleon, who goes on to recount the story of how he infiltrated the police, saying his motivations were to check up on said prisoner and since the Legion's relationship with the SP is a rough one, he thought it was easier than just asking to see the prisoner. While in the cell he meets Jeyra, a telepath from Saturn Girl's homeworld of Titan, who was brought in as a consultant on the case. She tells him that while she was in the cell with the prisoner trying to get information out of him, a large robot teleported in and killed him right in front of her. Chameleon and Jeyra travel to the lowest levels of Metropolis, where the robots dwell, trying to find information on what they're up to. It turns out some other people have been impersonating SP officers and are selling pieces of technology to the robots on the black market. The robots are using this technology to revive some of the old bots that were shut down in the Singularity Wars, when humanity had to disable all AI or risk falling at their hands. One of these old robots comes back online and instantly points out Chameleon and Jeyra as impostors, which causes Chameleon to blow his double cover as he transforms into a large beast to dispose of the attacking robots. He interrogates one of the fake SP officers, who claims they had nothing to do with the assassination of the prisoner. Chameleon and Jeyra return to the surface level of Metropolis where she kisses him, before they head off to examine the prisoner's cell again. Chameleon investigates every manner someone could have gotten into the cell, including teleportation, and determines that it was impossible, thus painting Jeyra as the only one who could have killed the prisoner. He realizes it too late, however, as she's got a gun trained on him and was able to steal his Legion ring when kissing him, without him ever noticing. She confesses to working with the robot rebellion, as the prisoner was, and she was sent to kill him before he could ever confess to it, and she used her telepathic powers to make him kill himself. Chameleon finds an opening and is able to knock Jeyra out, which is where the SP found him. They agree to let him go, once he's able to give them the names of the other people posing as SP officers. There's also a short subplot about Supergirl looking for Seiss, the kid whose powers went crazy back in issue 17, and who was last seen being manipulated by a shadowy figure. Being unable to find him, she later shows up at Legion HQ with Lightning Lad and Cosmic Boy, who say Dream Girl's people have agreed to rescind their demands if her body is turned over to them immediately. Supergirl uses her X-ray vision on Brainiac 5's lab, only to discover that he's gone, and has taken Lemnos and Dream Girl's body with him. Story - 3: This was the weakest issue of the series that I've read yet. It wasn't bad, although it was pretty predictable. As soon as Chameleon made a point of mentioning how completely impenetrable the prisoner's cell was, and the fact that Jeyra was actually already in there, it wasn't too hard to figure out. We had no real reason to ever believe Jeyra was innocent, or any stake in the outcome of the investigation, so it left me a little cold. I also don't understand why any humans (or aliens) would be helping out the robot rebellion, but I suppose that will be covered in subsequent issues. The bits with Supergirl seemed a little tacked on, although they did advance two other stories so I can't really complain about those. And while we do get to know a little more about Chameleon, there's not any really great or defining character moments that made it terribly worth it. Not terrible, but not as good as the other fantastic issues Waid's been delivering. But if the worst episode of the series so far is still decent, you know you've got a good book on your hands. Art - 5: Back to Kitson at his best. That's all there is to say about that. Cover Art - 3: The dead person on the cover has multiple limbs. The dead prisoner did not. 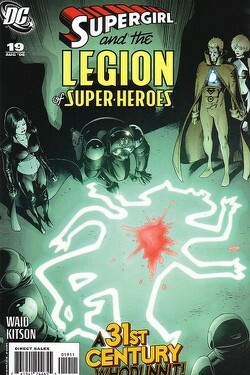 There are three Legion members on the cover, but not one of them appears in the book. Chameleon, who is heavily featured in the book, is nowhere to be found. I'm sorry, but the many-limbed chalk outline with the blood stain is just funny to me, which doesn't exactly lead me to think I'm getting a serious detective story.